Almost impossible to go unnoticed, copper is certainly having a moment in the interior design world. From sleek accessories to glossy finishes, transform your home with the hottest metal of the moment. Accessories are an easy way to add some copper to your interior. Chosen as a standout piece, or used sparingly throughout the room, it will add an instant sense of luxury to your living room. 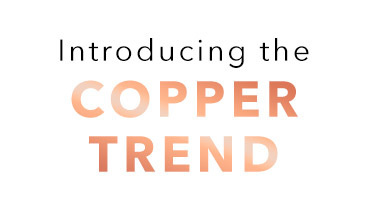 Bring your bedroom bang up to date and add instant warmth with reflective copper accessories, clean lines and smooth finishes for a contemporary look. Don’t be scared to mix your metals, this works really well in modern kitchens. Fuse high-shine copper utensils and darker tones for a truly unique kitchen with the wow-factor. Think champagne and rose gold shades for the bathroom. A sleek hanging wall mirror creates the illusion of a more spacious room, while a border of glossy copper accessories behind a basin or around the bath adds a glamorous feel.